Today HIRA brings you Part 2 of a special message about corruption in our party. For yesterday's Part 1, please click HERE. WARNING : The results of our independent audit are not pretty. You may never want to donate to the Hawaii GOP ever again . . . or at least wait until it is under completely new and non-corrupt management. You often hear and read about scandals involving corrupt nonprofit organizations which spend the vast majority of donations on overhead and salaries instead of needy kids or homeless vets or curing a disease. Welcome to the Hawaii Republican Party. It's become a total scam. State party officers Rohlfing, Saiki, Hellreich and Marumoto are grifters who run the scam. And you are their marks. Despite their making inspiring, ultra-specific promises that Lincoln Dinner ticket purchases and related donations will help needy candidates, get voters registered, educate the public, and win elections, NONE OF THAT IS HAPPENING. See how they've spent your contributions after making the empty promise that the proceeds from each year's Lincoln Day Dinner are used on strategies to help Republicans get elected. Instead of spending your valuable contributions the way they promise, or the way party leaders budgeted, the monies from Lincoln Dinner fundraisers have only gone to overhead and salaries. Your State Committee, charged with oversight, would know this if they exercised their fiduciary responsibility to force any of the past four skipped audits to be conducted. This chronic malfeasance by corrupt party officers is a major reason why we lose year after year. 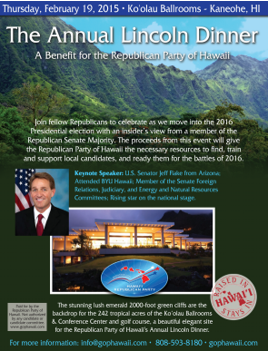 Lincoln Day Dinner 2015, featuring Senator Jeff Flake, was on February 19, 2015 when they ' officially' changed the name of the party to the Republican Party of Hawaii and unveiled a new logo. Ticket buyers, donors, and sponsors were explicitly promised that " The proceeds from this event will give the Republican Party of Hawaii the necessary resources to find, train, and support local candidates, and ready them for the battles of 2016." Not so. Every penny raised from that event has been spent on administration, overhead and salaries before Election Year 2016 even arrived. There's NOTHING left. They spent it all before 2015 was over. Candidates were not identified, trained or supported. That money is GONE. Not a thing promised was initiated, or accomplished. You thought you were helping Republicans to win in Hawaii, but you paid for routine overhead, inflated salaries, and inaction. Every penny spent. 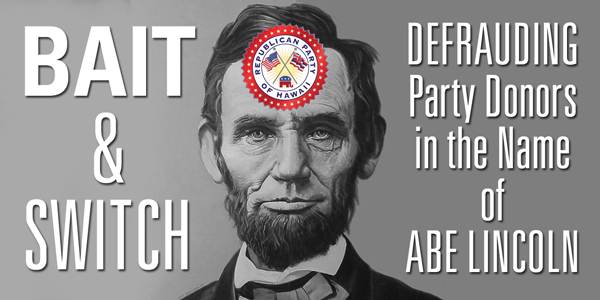 For brave Republicans who step into the ring, the 2015 Lincoln Day fundraiser is a memory of broken promises about 2016. Lies and broken promises galore. 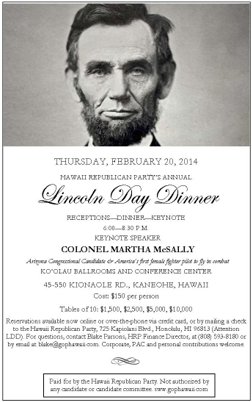 One year earlier, 2014's Lincoln Dinner fundraiser was on February 20th. Candidate Martha McSally was the keynote speaker. The promises made by party leaders were again very inspiring and ultra-specific: " The Lincoln Day Dinner is our largest annual fundraiser that gives our Party the necessary resources to train candidates and their volunteers on messaging techniques, identifying voters in their neighborhood, and how to turn them out on election day; plan and host a state convention in May to introduce our membership to all of the candidates, debate our Party's platform, and undergo extensive campaign training; print materials for door-to-door walk groups to disseminate; organize coalitions to target groups of like-minded people who share our values; set-up phone banks at the HRP HQ to contact our supporters; sponsor events for College and Young Republicans; and much more ." All the proceeds went to salaries and overhead instead of fulfilling these empty promises. Last year, fishy financial reporting and bogus claims caused HIRA to look closely at party finances. 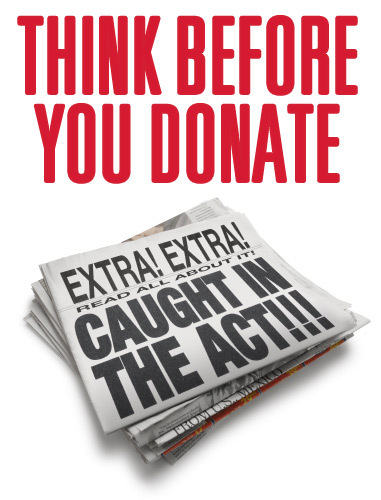 We quickly discovered that party leaders' routinely used the con game of " Bait & Switch" to attract your donations to "pay down the mortgage". HIRA exposed that scam, along with embezzlement and other corruption. That investigation got us looking even deeper. It turns out that there's MUCH MORE to the story of fraud at the Republican Party of Hawaii. Party leaders at the Republican Party of Hawaii have been completely DISHONEST about the use of your money and probably haven't been trying to get Republicans elected. These corrupt officials have zero interest in delivering on their empty promises. Sadly, officers like Fritz Rohlfing and Republican legislators like Beth Fukumoto (a recent former party chair herself) continually fail to provide accountablity; choosing instead to circle the wagons and turn a blind eye. These people could address the corruption if they wanted. So very disappointing. Chief con artists Miriam Hellreich, Pat Saiki, Barbara Marumoto and their team have lied so many times, they cannot be taken seriously. Their repulsive 'bait and switch' shell game has been operated with impunity for years. They continue to promise that money from Lincoln Day fundraisers will be used to help Republicans win, while they repeatedly promise that your donations to 'capital campaign' fundraisers would be used to pay only the mortgage. That doesn't even pass the laugh test. They knowingly lied, as you've heard the taped backroom discussion. "They act just like Democrats." The liberals who hijacked our party for too many years now have been running the Hawaii GOP into the ground. They are abusing party funds and lying about it in the exact same way that Democrats abuse tax dollars and lie about that. So the longer we let these corrupt RINO's control our party, the longer before a majority of island voters will take GOP challengers and our party seriously. For now, when they see an "R" next to a candidate's name on a ballot, most will keep voting "D" or even just stay home. The waste, fraud and abuse at the Republican Party of Hawaii makes our corrupt Democrat-run state government look efficient and honest by comparison. As Republicans, we can't blame our problems on anyone else. We must clean house. Every penny of our donations is supposed to be spent convincing voters why they should vote Republican, NOT blowing it all on a bloated and self-serving bureaucracy. This terrible situation reflects poorly on party leaders and their sycophantic supporters. But members of the party who want a brighter future for Hawaii are the ones who suffer. That's why your money is better used when donating directly to candidates who want to win and who don't waste precious funds on massive overhead. 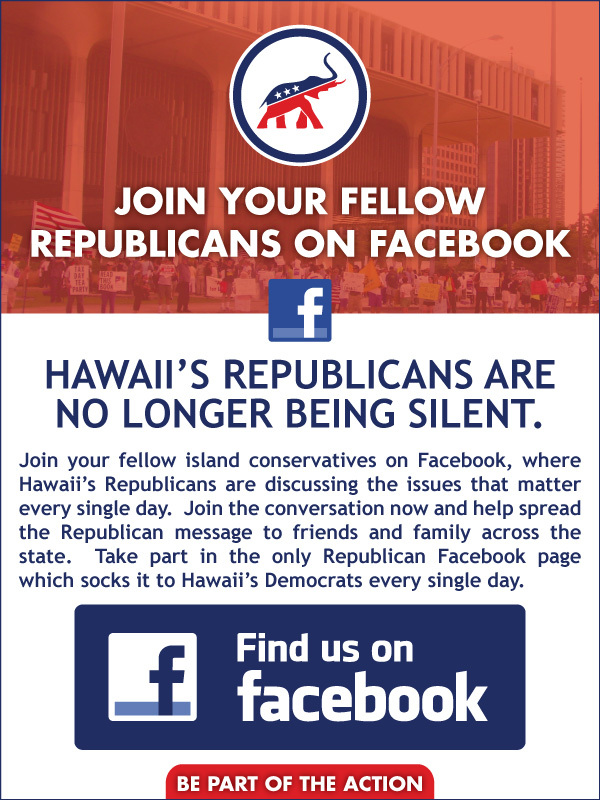 The Hawaii Republican Assembly urges you to direct your generous donations to Republican candidates. 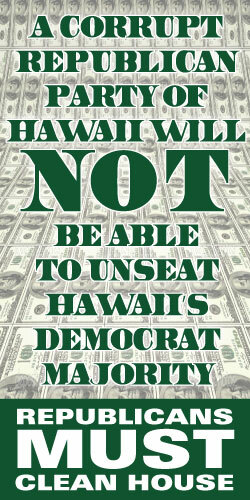 As Hawaii's only Republican SuperPAC, that's what we'll do: Donate Directly to Candidates.